So you posted us having a score of -12 but during the round I thought you said we finished -13? Just curious. But either way nice shooting and once again happy birthday bud. What up. Had a blast at that tourny. Hit me up if you are ever around the oxford area. Good luck out there. I played 2 rounds in St. Charles. I guess that makes 3 of us crazy. LOL. I actually thought it was nice out. Got pelted with a lot of sleet but no wind was nice. I love the new layout at St. Charles. No more -10's though. Just got done with 2 more rounds at St. Charles. You are right , 2 very nice days to play in my opinion. Fairly warm, no wind, and I didn't get bit by even one mosquito. I throw more in the winter months thanany other time. Love it. The best tournament I ever played in was the ice bowl in kalkaska last year. 10 inches of fresh powder on top of 6 inches of previous snow and a wind chill of -28 below at tee off time. Sold out and everyone had a ball. Best tourney ever and I will be there again this year. Have a good round. Solid shootin Josh. Way to hang in there with the with the weather conditions; 30 mph wind gusts and cold rain. Great Ace! Never seen that one hit. 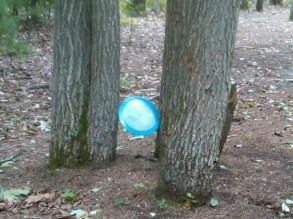 Hole 8, that must have been pretty. Nice shot! nice ace on 8 man. skipper? or on a line? on a line buzzz ss with a lil anhyer along the left side then faded to the middle of the fairway once it got to the treeline then boooom right into the middle of the chains!!! I thought it was only women who claimed it was their first time. Cant make it tonight Happy Birthday enjoy! Nice ace, I'm guessing another skipper? I have to get out golfing more and catch up on the ace count. Nice ace! I chained out for an ace on that hole earlier in the year haha. NICE ACE SEAVER!!!!!!!!!!!!!!!!!! THATS THE LAST HOLE THERE THAT HASNT BEEN HIT!!!!!!!! hows it feel to be the first one to write your name on the pin? Displaying 1-20 of 28 total board posts.